BOSTON - Confetti cannons boomed and huge crowds of fans accustomed to the success of their beloved sports franchises cheered wildly as duck boats ferried the Boston Red Sox on a parade through city streets to mark the team's fourth World Series championship in the past 15 years. The parade began Wednesday at the venerable Fenway Park and wound its way through several major downtown streets lined on either side by fans numbering in the hundreds of thousands, some who arrived before dawn to stake out the best vantage point and many clad in Red Sox jerseys, sweatshirts and caps. Bits of red, white and blue paper rained down on the crowd on the crisp autumn day as they waited for a glimpse of the ballplayers passing in the city's emblematic amphibious duck boats. The players and members of their families waved down in response from the open-roofed vehicles. Security was tight along the route, which took the team past the site of the deadly 2013 Boston Marathon bombings. No public drinking was allowed. Uniformed police officers lined the route, and plainclothes officers mingled with the crowds. Roads were closed and nearby parking limited. 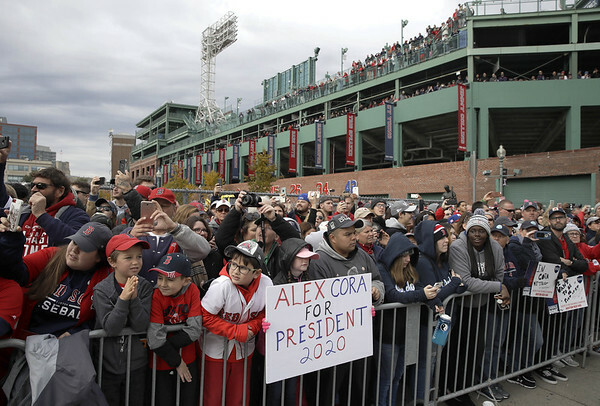 During a pre-parade ceremony at Fenway, Red Sox manager Alex Cora thanked fans for supporting the team during what he called a “historic season” in which the Sox won a team-record 108 games during the regular season before beating the New York Yankees, Houston Astros and Los Angeles Dodgers in the playoffs. “I've been saying since Day One, this is crazy, this is madness,” said Cora, adding that his players shared the same high expectations of Boston fans. “And that's why they are world champs,” he said. Colognesi allowed that he was still recovering from the 18-inning Game 3, a reference to the team's only loss to the Dodgers during the World Series. Anti-Yankees chants could also be heard along the parade route a nod to the long-running rivalry between the two American League squads. Boston fans learned even more good news Wednesday when pitcher David Price announced just before the start of the parade that he planned to stay with the team, declining a contract option that would have enabled him to become a free agent. The left-hander, who was the winning pitcher in the clinching Game 5, will earn $127 million over the next four years under the seven-year, $217 million contract he signed with Boston before the 2016 season. On Tuesday, the Red Sox announced they were exercising their $15 million option for next season to retain another star pitcher, Chris Sale. “If you see something out of the ordinary, let us know,” Walsh advised fans during an interview with New England Cable News. Posted in New Britain Herald, General Sports on Wednesday, 31 October 2018 11:36. Updated: Wednesday, 31 October 2018 13:03.